This post originally appeared on the very influential Philofaxy blog on Monday 11th July 2016. Since I’ve not worked out how to reblog a blog from Blogger on WordPress, here it is in its entirety. Suffice it to say we are a just bit proud of the fact that our new paper was given a resounding A* in comparison to the other papers tested for ink showthrough! Ours is the only paper with absolutely no show through at all! And we were up against Filofax and Rhodia Pad papers. “You might recall a few weeks ago we featured a post asking for thoughts on Dodo Pad making packs of paper available. Well on behalf of Rebecca at Dodo Pad, thank you to everyone who responded to the post either in the comments or by email to Rebecca at Dodo Pad. After some hard work the packs of paper are now available on the Dodo Pad website for purchase. Rebecca kindly sent me some samples of the paper to try out and share the results with you. Whilst I’ve done some paper tests in the past I sat down and thought about this one a bit more than the previous ones. I wanted to present the results in a fair and balanced way as possible. 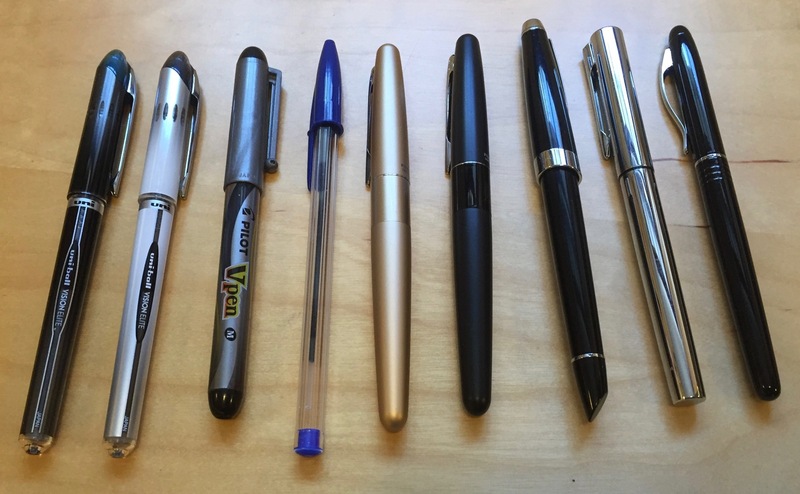 As we all know what pen you use and what paper you use can often bring about some compromises as to what pen you can use with what paper you have in your organiser. We are always on the constant hunt for paper that will take fountain pen ink or gel ink without feathering or bleeding through. So for this test I set out with a selection of pens, which are predominately fountain pens with medium or fine width nibs. 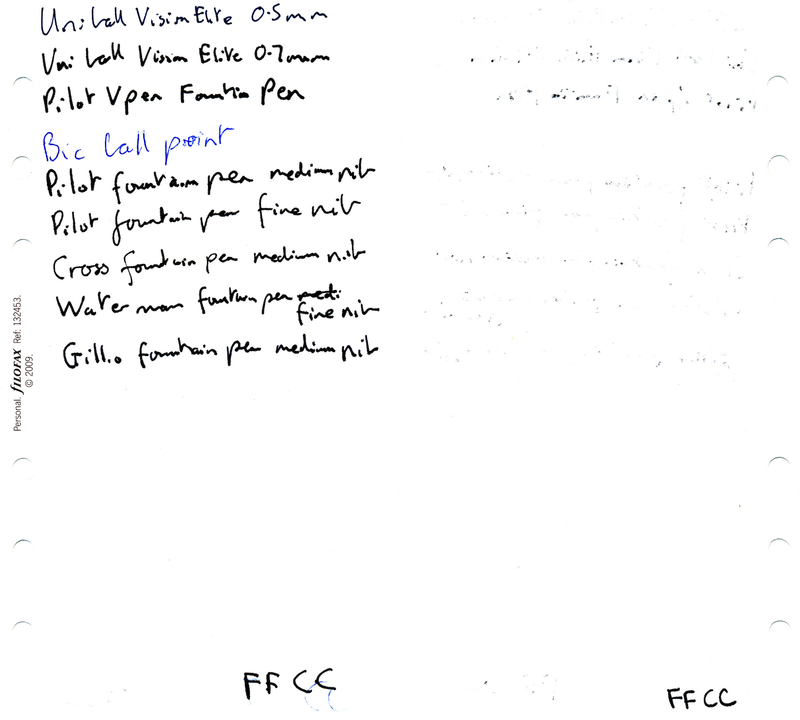 My hand writing is not the best for broad width nibs…. or just bad in general! Yes I know! I included a couple of gel pens which I use on a daily basis and a standard Bic ballpoint as a ‘control’ standard. I scanned in each sheet using a flat bed scanner and without manipulating the images in any way at all joined the front and reverse sides so you can see the front and reverse in one image. The scanner of course uses a bright light source to perform the scan, of course on white paper this will show up writing on the reverse side depending on the rate of ink absorption and paper thickness etc. But as each paper sample was scanned in the exactly the same way the results should give you a reasonable assessment of each paper sample. The results are not too surprising. 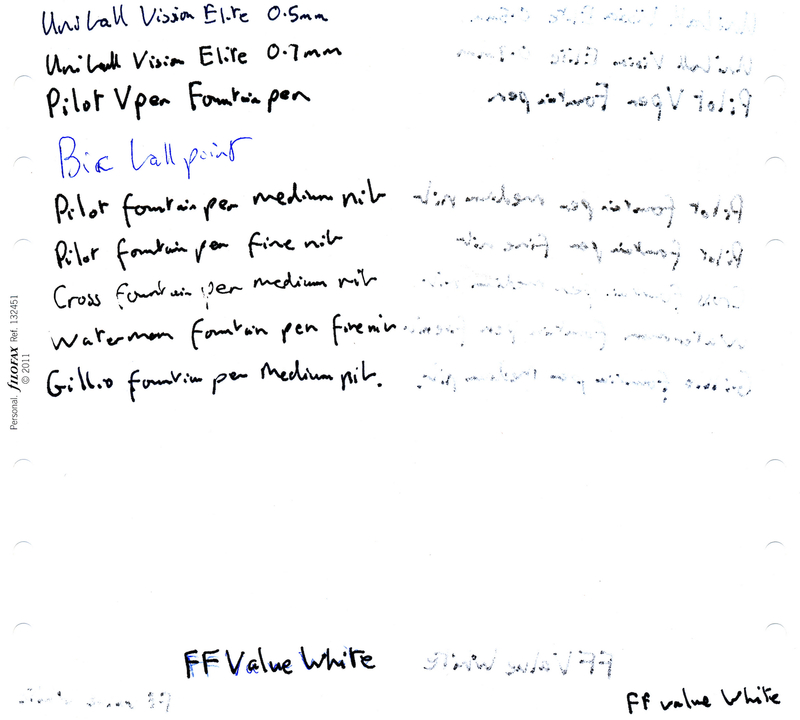 The Filofax White thin paper can not take any form of wet ink without bleeding through, it is almost like blotting paper! Filofax Cotton Cream is slightly better. But paper weight isn’t obviously the only factor for the performance of paper with regards to wet inks. Compare the Filofax Cotton Cream with the Rhodia Pad paper, it is the same paper weight yet the Rhodia pad shows no bleed through at all. 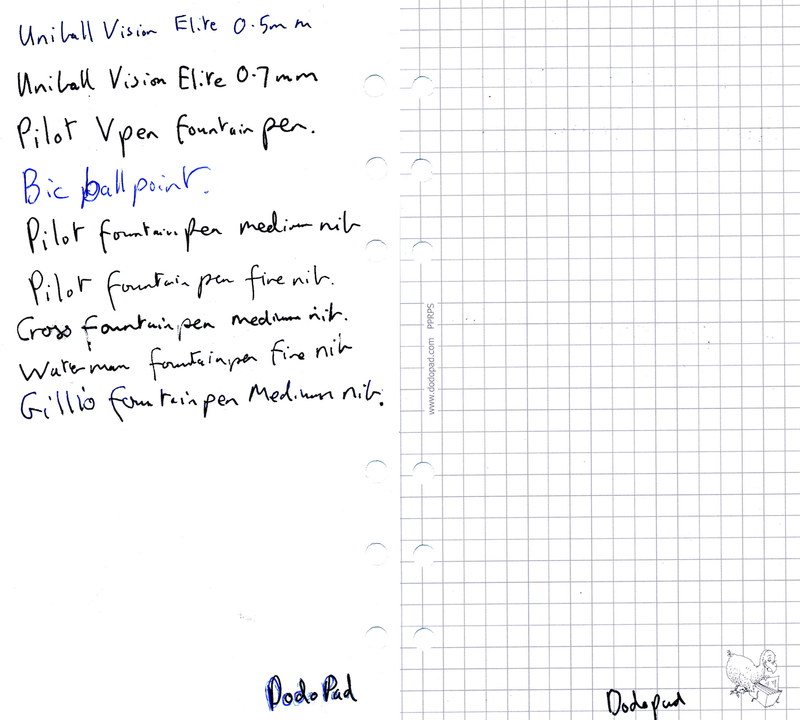 On the Rhodia paper there is a faint shadow of the writing of all pens, but in every day use I doubt if this would bother most users. 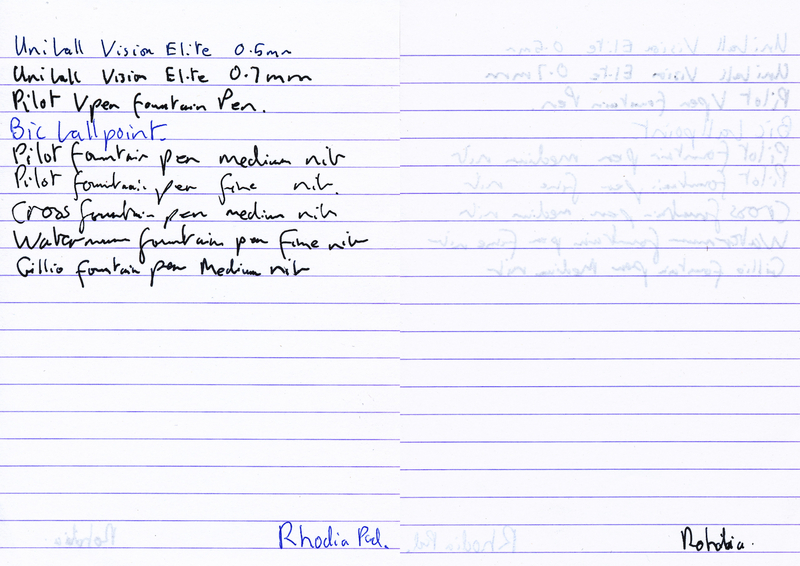 And finally a clear winner in this test the Dodo Pad paper, no bleed through and no shadow at all. The Dodo Pad paper as you can see is square ruled on one side with a discrete logo in the lower right hand corner and plain on the reverse side. It comes at present in three sizes, Personal, A6 and A5 sizes. It is available in packs of 25 sheets or at a discount if you order it in packs of 50 sheets. So how much does this wonderful paper from Dodo Pad cost? A pack of 25 sheets of Personal size or A6 size will cost £3.75 per pack or £4.50 for 25 sheets of A5 paper. If you buy two packs at the same time you save 10% on the overall product cost. Dodo Pad have also given buyers a special offer on their delivery charges. Their standard UK postal/processing charge is £3.50. They realise that this is quite high if you just want to try the paper out, so they will reduce the UK delivery cost for up to three packs of paper or a shopping cart value of £10.50 (whichever is the greater) by 50% to £1.75. Enter 16PPR at checkout This code will work until 31st March 2017. You can find the whole range of organiser compatible products including diary inserts on the Dodo Pad website. Do-do you still use a Filofax Deskfax? Lord Dodo (sorry, Kitchener) WANTS YOU! Dodevoted · A series of occasional ramblings about anything and everything to do with the Dodo Pad, purveyors of Britain's favourite diaries, calendars, organisers, planners and everyday stationery.